Last weekend a friend and I decided a few months ago to get some hands-on experience with wilderness survival in backcountry Alberta. No sleeping bag, no tent, no thermorest, or blanket. Just our clothes, knife, kit and wit. Are we motivated by some “Into the Wild” romantic notion of escaping civilization and living off the land? I am sure there is an ancient desire in us to play the game of life hunting, stalking food, but also to be hunted and stalked. For me, I wanted to revisit the fundamentals of life, to appreciate what civilization gives me and also what civilization depends on. 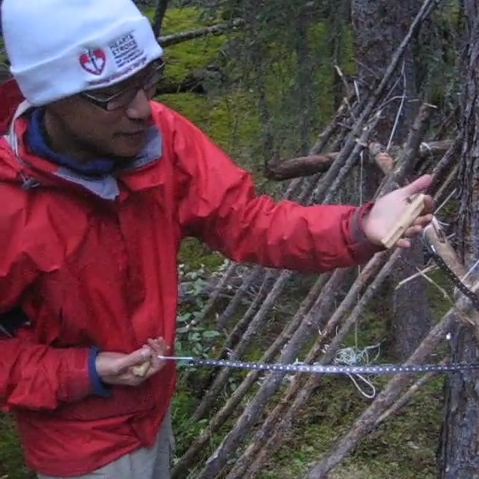 In the one wilderness survival course I took, I felt that it was a visceral and real experience. Not that life in the city isn’t real, but it can be hard to tell the difference. Documents are signed, meetings are held, events planned… but its importance seems minuscule or so we think. In the wilderness, what you do matters. Your survival is a struggle between your understanding of reality and reality itself. Out there, civilization seemed an insect to the elephant that is nature. The earth was an infinite sink of coldness where the sky rained down misfortune even as the mossy forests inspired a moment’s pause from everything in my life. Isn’t it funny that this is what it takes to remind me that civilization is like that first band of human beings that fought for survival. Life is on the edge. Our survival is always on the edge. And it doesn’t matter if we stop paying attention or get caught up in the latest television show, nature still trumps civilization. You are one of the most creative and adventurous men I know! Good on ya!! Because of what I do – right away my thought was on the vaseline, imagine that people put that on their skin! So – I had to watch both video’s… impressive, you both survived!!!! Great information you guys! Question out of pure curiosity – what was the first thing you went to eat at the end of your adventure? Heh, heh… I had the chef’s special at a New Orleans restaurant in Canmore. A fish of some sort…. I didn’t care. I ate the entire plate out and was ready for a second meal. 🙂 But isn’t it interesting that we use vaseline on people? And it is clearly labelled, petroleum jelly.